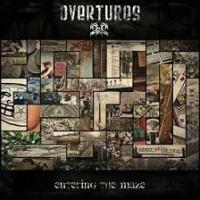 After a lot of work, dedication and many experimentations while searching for the right line-up, the band OVERTURES from Gorizia, Italy, have just released their third album “Entering The Maze” which was brilliantly engineered and mixed by the band leader and the very skilled vocalist Michele Guaitoli, who does beside this technical studio wizardry, a few prowess in delivering some very passionate vocal interpretations. Indeed, he shows an impressive diversity in fitting perfectly with each kind of song, switching easily with talent between harsh, gruff and lyrical singing with luxury, as in the track “Of Nightmare” or once again, in excelling from tenor extravagance ("In the Middle of Nowhere" or "Savior") to a similar Andi Deris / Fabio Lione's high-pitched quick vibrato mode (“The Maze”) keeping proudly his versatility shining as his main asset in his own singing arsenal. The whole group also play at a quite stellar technical level with fluidity notably , the superb drumming onslaught, almost every number contains thundering and pumping double-kick assault and I also had to mention the former member Stefano D'Amore as guest lead guitar player who provides nothing more than seven huge solo spots. This album is the second published under the wake of the Greek label Sleaszy Rider Records, the 2010’s “Rebirth” was pretty interesting, but I think this time with a refined sound and a such fine collection of tracks with strong consistency like “Under The Nothern Star” or the headbanging anthem “Programmed To Serve”, they could have been on the list for the next hope in Spaghetti Power Metal. I believe we'll soon classified OVERTURES as a hard to beat contestant for TRICK OR TREAT / VEXILLUM / ARTHEMIS / HOLLOW HAZE / SECRET SPHERE and Co.
Of course, my friends please, don’t expected nothing really new, no revolutionary invention or a world changing music style but, a well-crafted in the Euro Metal tradition, like the emotional and melodic “Empty Trails” that sounds very much like an AVANTASIA track or the energetic and powerful “Consequences” very near of the VISION DIVINE early style. Also I have to mention that as a gift "Entering The Maze" comes with a cool bonus disc in DVD format, containing the brand new official video clip "Savior", as well as the a making-of , but also the older "Fly, Angel", a RUNNING WILD cover song and a bunch of five tracks played live in the studio. Definitely a great idea and the best way to complete utterly, this very good album that ends in a climax with the nine minutes epic grand finale “The Oracle” with an adventurous shuffle, some mysterious atmospheric flavors under dark arrangements with many bombastic varied symphonic movements. A prelude to a close approach in Labyrinth type perfection.